Jaedyn was born on March 16, 2004 in Amarillo to Michelle Penton and Chris McGruder. 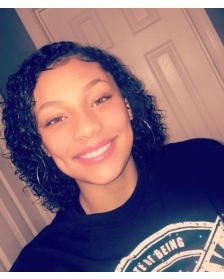 Jaedyn was very athletic playing volleyball and basketball for Palo Duro High School where she was a freshman on the junior varsity basketball team. Jaedyn was also a very fashion forward budding cosmetologist who loved to do hair and nails. She was very active in all of the youth group activities at Greater Love Temple Church. She loved her shoes, music and baking her famous chocolate cupcakes. Jaedyn loved her family and friends and she felt that she was a "Messenger to her Generation" and she will be greatly missed by everyone. She is survived by her mother, Michelle Penton; her father, Chris McGruder; her sister, Alaysia Penton; three brothers, Zion McGruder, R'eon Penton and Jasiah Penton; her grandparents, Donna and John Swanson and Bishop J.G. Riles Sr. and Dr. Georgia Riles and numerous other nieces, nephews, aunts and uncles. The family will be receiving friends from 5:30 to 7:00 pm, Thursday, February 7, 2019 at LaGrone Blackburn Shaw Martin Road Chapel.